French President Emmanuel Macron Calls Australian Prime Minister Malcom Turnbull's Wife "Delicious"
Coincidentally, the french word for 'delicious' - delicieux - also means delightful or lovely. A week after his much-talked-about state visit to America and meeting with Donald Trump, Emmanuel Macron touched down in Sydney on Tuesday for a two-day trip. And if you thought the French President's trip Down Under would be one without any faux pas, you're wrong. During a joint press conference with Australian Prime Minister Malcolm Turnbull, an unfortunate choice of words by the French President raised many eyebrows. 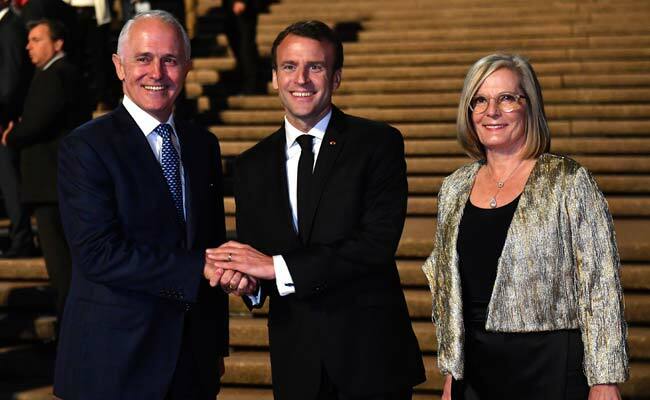 Mr Macron, usually quite fluent in English, goofed up this time while expressing his gratitude to Malcolm Turnbull and his wife, Lucy, for their hospitality. "For the French gastronomy, for the French winery that I wanted to thank you and your delicious wife for your warm welcome," he said while looking at the Australian Prime Minister. While most ooh-aah'd on social media, many wondered if it was a case of lost in translation as the french word for 'delicious' - delicieux - also means delightful or lovely. Macron just said he wanted to thank Malcolm Turnbull and his "delicious wife". Maybe something happened in the translation, but I'm pretty sure Macron just described Malcolm Turnbull's wife, Lucy, as "delicious". Macron calling Malcom Turnbull's wife "delicious" is making some waves in Australia. "I want to thank you and your delicious wife for your warm welcome" - French President to Malcolm Turnbull. Last year In July, Emmanuel Macron's wife Brigitte Macron was at the receiving end of a similar, seemingly sexist remark by US President Donald Trump. You're in such good shape," Mr Trump was heard saying to Ms Macron, before turning to her husband and continuing, "She's in such good physical shape. Beautiful." The interaction was caught in a video uploaded on Emmanuel Macron's Facebook page.